E-readers are the bane of my existence. I like books. I like the feel of books. The weight of books. Hell, even the smell of books. But no e-reader has challenged my page-bound allegiance like this new Kindle Paperwhite. It’s a lot like the old Paperwhite to be honest, which we loved lots and lots, except for one key difference—dat screen. Essentially, Amazon has transplanted the 300 ppi high-resolution display (twice the amount of pixels compared to the old version) from the new-ish Kindle Voyage and stitched it into this updated Kindle Paperwhite. And the best part is that this new version doesn’t cost a cent more than the old Paperwhite. It’s just $120 for all the e-reading goodness you could ever desire. Like always. 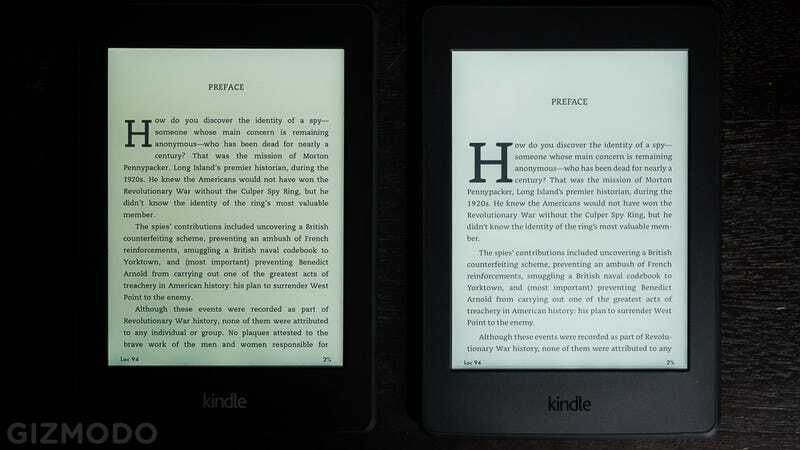 Here’s a side-by-side comparison (above and below) of the Paperwhite (2013) on the left and the new Kindle Paperwhite on the right. In addition to that new display, Amazon’s also turned on its new Bookerly font—specifically designed by Amazon for reading—by default and completely redesigned page layout with a new typesetting engine, using hyphenation so you’re not left with awkward spacing and so it feels more like a book rather than a jumbled up digital mess of words. The new Kindle Paperwhite will begin shipping June 30. I don’t think my soul is ready to completely forsake by book-bound brethren, but my resolve is slipping.